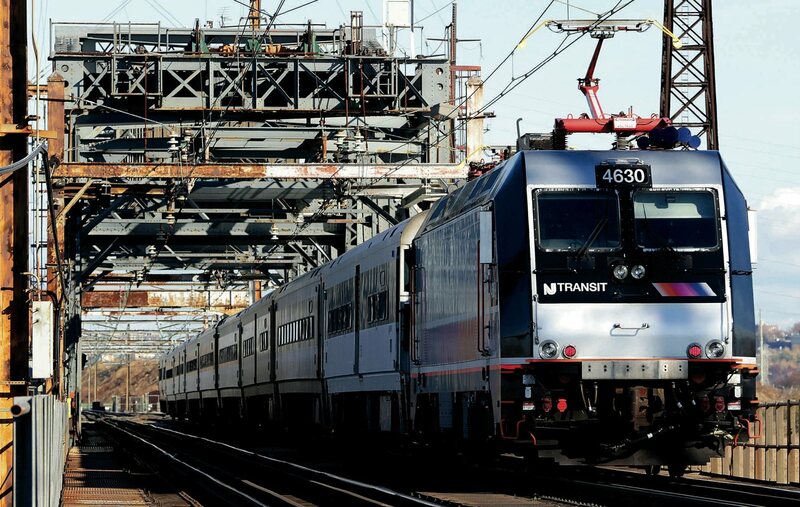 A New Jersey Transit train crosses a 1910 bridge in Kearney, N.J., over which 150,000 to 200,000 passengers cross daily—making it perhaps the busiest rail span in the Western Hemisphere. It is obsolete, but a $940-million plan to replace it remains unfunded. 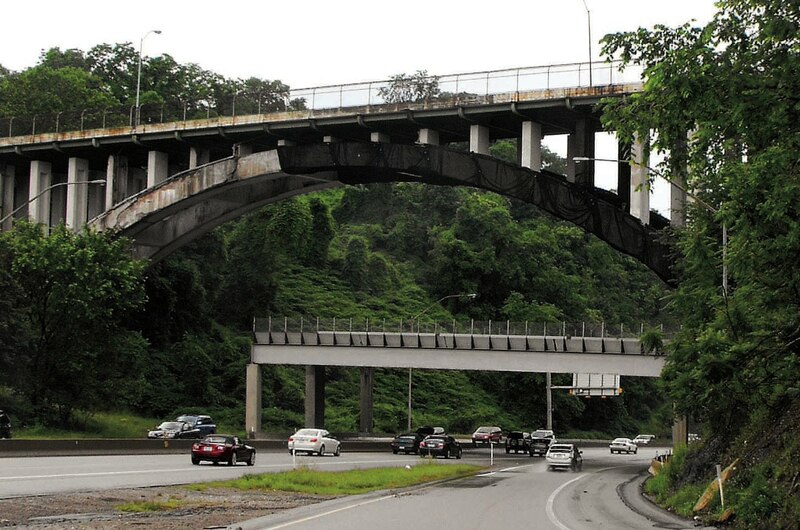 A substructure protects motorists from falling concrete until Pittsburgh’s 1922 Beechwood Boulevard Bridge is rebuilt. The nomination of Boston as the U.S. host city for the 2024 summer Olympics preceded much public discussion of the potential benefits and costs. Andrew Zimbalist, Ph.D. ’74, is perhaps the foremost analyst of public investments in sports facilities and global athletic competitions, so Harvard Magazine asked him to draw on his recent scholarship to assess the Boston bid. More broadly, Harvard Business School’s Rosabeth Moss Kanter has just examined the deplorable state of infrastructure in the United States—a question of special importance in Boston, where the ancient transit system literally stopped running during the past winter. Kanter puts the problem in its fiscal context, but also looks at issues of technology, competitiveness, economic development, and equity. Suffering was acute in Greater Boston this past winter. Harvard closed twice, once for two days, canceling classes and offering Cambridge hotel rooms to essential workers who couldn’t get home. Car owners were unable to move as snow piles mounted to record levels, eventually totaling more than nine feet. But the worst blow was the shutdown of the region’s famed public transit system, the Massachusetts Bay Transportation Authority (MBTA). Loudspeaker announcements at T stops blared, “Seek alternative means of transportation.” A Harvard employee moaned, “This is my alternative transportation,” and walked back home for another disrupted day out of the office. Infrastructure failures can always be blamed on poor management. A panel convened by newly elected Massachusetts governor Charlie Baker ’79 pointed to financial mismanagement and governance weaknesses behind the T shutdown. But chronic underinvestment is clearly a major culprit. The MBTA, America’s first and oldest subway, has long operated with aging systems that politicians felt taxpayers were reluctant to pay to renew or reinvent. The T’s winter shutdown is just one instance of numerous U.S. infrastructure problems that stem from a failure to invest. 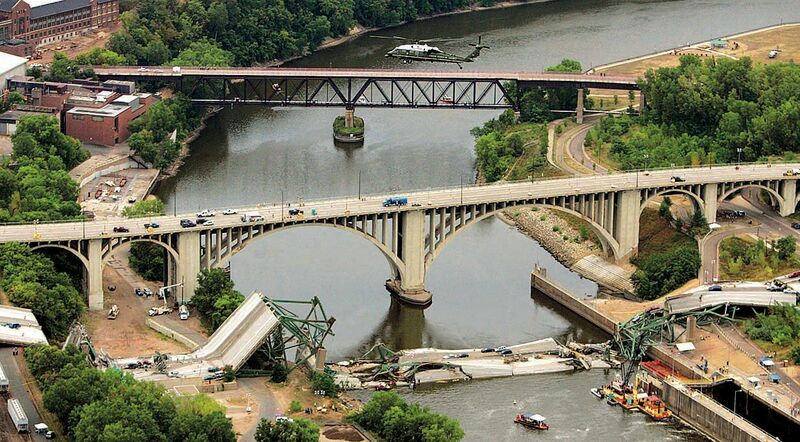 During the past 25 years, the United States has had nearly 600 bridge failures, for instance—including a 2007 collapse in Minneapolis that killed 13 people. Federal officials have deemed a full quarter of U.S. bridges structurally deficient or functionally obsolete. By 2023, one in four U.S. bridges, which are typically designed to serve for 50 years, will be more than 65 years old. The average American commuter wastes 38 hours a year sitting in unnecessary traffic—and undoubtedly more than that in the Northeast Corridor between Boston and Washington, D.C. In May 2013, a commuter train crash in Bridgeport, Connecticut, which injured 76 people, closed all eastbound rail traffic between New York and Boston. An estimated 30,000 people who normally took the train to work took to the highways instead, exacerbating already-legendary traffic jams. The problem was traced to a single broken rail, although that was just one of many trouble spots resulting from years of deferred maintenance of components dating to the late 1800s, such as overhead catenary wiring that is more than 110 years old. Upgrades have been under construction for 20 years. It could take big bucks just to repair, let alone modernize, existing infrastructure—almost $2 trillion during the next five years, according to estimates by the American Society of Civil Engineers. Delays in every transportation mode bring costs to the economy and lost opportunities for productivity and quality of life; flight delays, for example, cost the economy an estimated $30 billion to $40 billion annually. I discovered the mind-numbing magnitude of these problems after embarking on a nearly two-year effort to understand transportation and related communications infrastructure issues by conducting interviews and site visits across America and by convening a national leadership summit as part of the Harvard Business School U.S. Competitiveness Project (see “Can America Compete?” September-October 2012). In the 2013-14 survey, business leaders identified infrastructure as a major area in which America lags: 82 percent of respondents said that U.S. transportation infrastructure had not improved or was getting worse than it was three years earlier—and a majority believed it was falling behind that in other advanced economies. That’s easily seen by anyone who travels internationally. Japan recently celebrated the fiftieth anniversary of the Shinkansen, its world-standard bullet-train system that runs routinely at 150 to 200 miles an hour, is on average a mere 36 seconds off schedule, and has never derailed. In Germany and France, the ICE and TGV high-speed networks, which started service in the 1980s, reach speeds of 200 miles per hour. In contrast, the United States has antique wiring and accoutrements, and the supposedly high-speed Acela can reach its top speed of 150 miles an hour for only a short stretch of its route. The state of transportation infrastructure touches every important societal issue: health and safety, air quality, family budgets, productivity and use of time, inequality and social mobility, the nature of cities, jobs for today and jobs for the future. Public transportation in particular, I found, is an important ride out of poverty and into the middle class if it provides access to jobs and education. Once America was the world’s acknowledged innovator. Now we’re stuck on the way to the future—stuck in traffic, stuck in congressional gridlock, and stuck in history. Starting just after victory in World War II and continuing into the 1960s, the nation constructed models and crafted policies that have shaped American lives for 60 years. The interstate highway system, for example, made the car the preferred mode of ground transportation. The legislation that created that system was not named the Drive Out Trains and Bicycles Act, or the Grow the Auto Industry Act, but it did both those things—changing residential patterns by hollowing out cities and growing exurbs, while making long commutes to work by car the national norm, shoving rail to the background. In 1956, with President Dwight Eisenhower’s strong support on defense grounds, Congress authorized the new national highway system by passing the Federal-Aid Highway Act, commonly known as the National Interstate and Defense Highways Act. The act authorized a then-unprecedented $25 billion to build 41,000 miles of superhighways in 10 years. 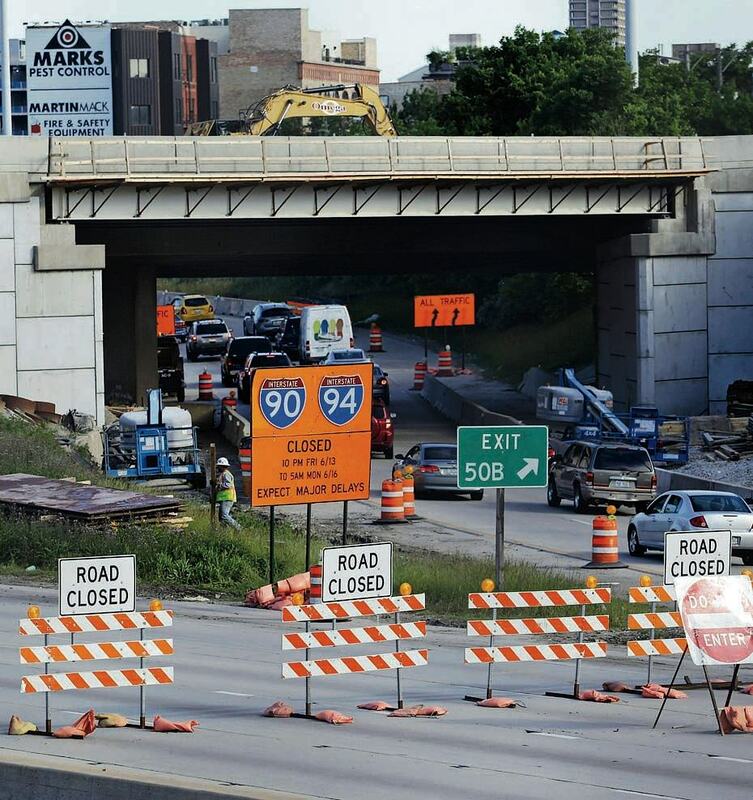 It also established the pay-as-you-go Highway Trust Fund, which is fed by gasoline taxes and remains the primary highway-funding vehicle 58 years later—and could soon run out of money. Planners laid out a highway system that would serve peacetime and strategic defense needs. Parallel defense-related actions boosted air transportation and funded airports via similar taxes. The Cold War and Sputnik provided one more defense-related investment push. Not coincidentally, this was a period of high, real growth in the U.S. economy. The United States was at the top of the game then. It wasn’t all idyllic, and rumbles of the push for civil rights and racial justice were coming. But moments of peak glory can be the time that complacency and decline set in. Ideas of the 1950s turned into social institutions with taken-for-granted assumptions that began to seem normal and inevitable—like building in extra hours to anticipate delays, but not joining a movement to address their root causes. The national system became a series of fragmented jurisdictions and industry silos, with each mode of transportation operating independently. For example, investment in rail—among the most productive and energy-efficient means of moving freight—was not a public priority, so private operators laid track wherever they wished, as the industry was ignored, nationalized, privatized, and consolidated, reducing incentives for maintenance and cooperation. Chicago, the most important railroad center in North America, is home to three of its 10 most congested rail crossings, where tracks and streets converge at grade level. By 2000, a train that took less than 48 hours to travel 2,200 miles from Los Angeles could then take a full 30 hours just to cross Chicago. In some spots, long freight trains could block the flow of cars—and emergency vehicles—for hours. Change requires political will, public support, and private sector savvy. In the absence of a strong national will, governors and mayors are taking the lead. In Chicago, the $3.2 billion CREATE (Chicago Region Environmental and Transportation Efficiency) Program, conceived more than a dozen years ago with a push from the business community, is building dozens of new under- and overpasses to segregate freight rail from passenger rail and vehicles, while installing a computerized control system to move trains more safely and efficiently. (The overall project remains partially completed and partially funded.) Mayor Rahm Emanuel, meanwhile, has introduced America’s first metropolitan infrastructure bank, the Chicago Infrastructure Trust, to attract private investment for vital city assets, such as an energy-efficiency retrofit of 60 city buildings, by repaying investors from electricity savings. California governor Jerry Brown is championing high-speed rail. Atlanta’s airport modernization is accompanied by mass-transit connections. Mayors are asking cars to move over to return streets to pedestrians, bicycles, and buses. Experts estimate that private capital, e.g. from long-term investors such as life-insurance and pension funds, could provide as much as $2.5 trillion for infrastructure globally by 2030—and the United States could be a major beneficiary. Well-conceived and executed public-private partnerships can deliver much-needed public goods at low cost while providing attractive opportunities for private investment. In some cases, industry might provide the lion’s share of funding. Freight railroad company CSX is using its own funds, primarily, to reconstruct the Virginia Avenue Tunnel in Washington, D.C., built seven years after the end of the Civil War, and part of a critical corridor between the Midwest and Atlantic ports, to accommodate high-capacity “double-stacked” freight trains, which are more efficient and environmentally friendly. Beyond desperately needed modernization of physical infrastructure, we must invest to take advantage of new technological opportunities to improve transportation and enhance our economic prospects. Digital systems, especially smartphones and wireless networks, can revolutionize roads and transform cars into computerized metal boxes mainly important for the software they contain. Entrepreneurs are putting sensors in cars and roadways and designing them to work together to avoid crashes and unsnarl wasteful traffic jams. In Boston, an innovative mobile app offered free by the mayor’s office can automatically detect and report potholes as residents drive on city streets, speeding the efficient dispatch of repair crews. Mercedes-Benz and other automakers have developed cars that can provide corrective steering inputs; General Motors CEO Mary Barra recently announced that new Cadillacs will be equipped with vehicle-to-vehicle (V2V) communication technology. America’s Big Three automakers are cooperating with Michigan and federal transportation officials and University of Michigan experts to perform a large-scale connected vehicle study. And industry is rushing to keep up with entrepreneurs who have created apps that reduce the need to own and garage a car: consumers can now use smartphones to summon cars via Uber and Lyft, unlock a Zipcar, or find out which mode of transportation works best from their locations—all smarter solutions, and less costly, than building more highways. The Port of Miami Tunnel illustrates the potential of all these new approaches. This billion-dollar public-private partnership came in almost on time and under budget, opening in the summer of 2014. In a region where more than 175,000 jobs depend on the seaport, an $18-billion economic driver that is serving a nation whose consumers and businesses depend on moving goods in and out of the country by ocean, the tunnel is a strategic growth opportunity, anticipating larger ships and more international trade as a result of the Panama Canal expansion. The tunnel takes trucks from the seaport directly to the interstate highway, removing them from congested city streets. This eases traffic in downtown Miami, reduces fuel use and pollution from idling 18-wheelers, and opens the city center for residential development, arts and entertainment, bicycles, and pedestrians. The Miami Access Tunnel company is 90 percent financed and owned by a fund raised by a French infrastructure finance company, Meridiam, in return for performance-based payments over 35 years. Tax-exempt bonds and federal grants will help ensure those payments are made, without raising taxes or drawing on general revenues. Attending the tunnel’s ribbon-cutting was José Abreu, a Cuban-American engineer who first dreamed of it 30 years ago, before and after his term as Florida secretary of transportation, and who continued as an advocate during several crises when it was near termination. Strong, committed leaders spark long-term infrastructure investments and keep them going, as President Abraham Lincoln did for the Transcontinental Railroad. Finding the will for infrastructure investment requires a new national narrative. I urge a focus on mobility as essential to opportunity. Rebuilding infrastructure and reinventing it using new technologies are essential to a new American Dream for the twenty-first century. Baby boomers who enjoyed the fruits of post-World War II investments must ensure that their children and grandchildren are not left stranded by winter storms or a failure to reinvest. Leaders must inspire by invoking a higher purpose and a vision that people can endorse. We need to tell the positive stories: how regions are taking matters into their own hands, entrepreneurs are helping us innovate our way out of traffic jams, and private-sector leaders are working with public authorities for the common good. Do we want twenty-first-century transportation and infrastructure to be people-centered, technology-enabled, environmentally friendly, opportunity-focused, safe, and efficient? Then let’s get moving. Rosabeth Moss Kanter is Arbuckle professor of business administration and chair and director of Harvard’s Advanced Leadership Initiative (see “Advancing Leadership,” March-April 2014). Her latest book is MOVE: Putting America’s Infrastructure Back in the Lead (W.W. Norton).